I first caught on to the idea of a tasting chocolate from a friend. She whipped up a rich, creamy, chocolate with a spread-type consistency using cocoa and coconut oil and a few other ingredients. I watched her eat it by the spoonful. Flash forward to my friend Shannon, during her pregnancy and afterwards, turning to her Justin’s brand nut butter with maple syrup, or chocolate in a little squeeze tube like a ketchup packet for a protein rich treat. I gave that stuff a try and loved it, but felt guilty about the packaging waste, and was somewhat stunned by the ticket price $1.79 on average per little packet. I guess you pay for the convenience of it. It was nice to just reach in my bag, pull one out and discreetly ingest it ( I have two kids under five years…having something for yourself means hiding and discreetly ingesting, ok!). Eating nut butter or even chocolate in this way is revolutionary for me. Not sure why it has taken me so long to really try it out myself. I’ve had ample examples from friends over the years. I remember watching my high school buddy eating peanut butter by the spoonful, but back then I just thought it was odd. I was locked into the idea that nut butters needed to be on something, not stand alone. It’s taken me this long to get on the band wagon! I’ve been really craving these small portions of nut butter during the day, but couldn’t bring myself to buy the packs, for the reasons listed above. I decided, I can make this myself by combining the tasting chocolate idea with the nut butter protein pack. 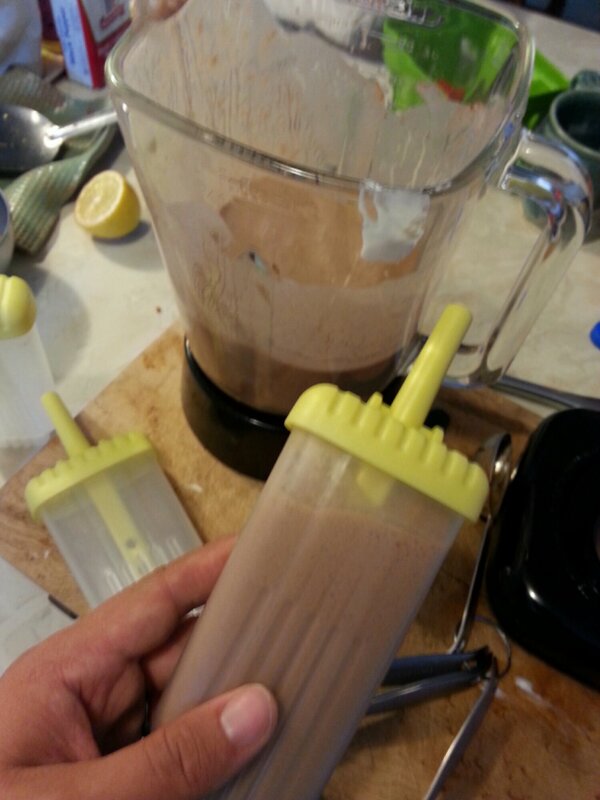 Last post I wrote about my DIY chocolate nut butter. This is just a little different, a little more indulgent, with a few additional ingredients and smoother consistency. 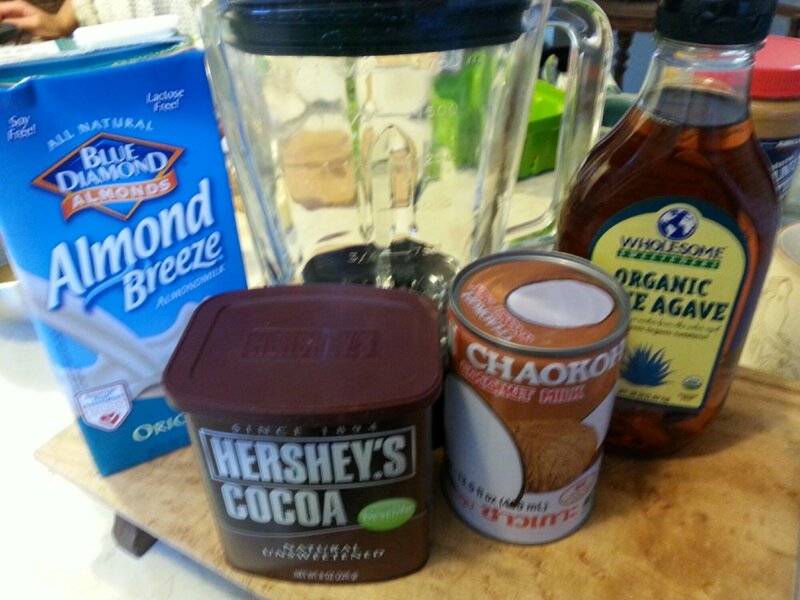 Optional ingredients: 1/4 tsp maca powder, 1/4 tsp vanilla extract, or cinnamon powder to taste. All of this is to taste. The approximate ratio for nut butter to everything else is 3:1. However, if your nut butter is a more thick/dry consistency (almond butter can be this way) you may want to ad more coconut oil, a tsp at a time. Combine nut butter, cocoa powder, and maple syrup and mix thoroughly. I like to ad a pinch of maca powder too but this is optional. Then add coconut oil, one tsp at a time to make it the consistency you want. I haven’t tried it yet, but I imagine a bit of vanilla extract would be nice, or a pinch of cinnamon. But that would be hypothesis on my part and not field tested. If you try it, let me know! Once mixed it should be a nice creamy, slightly thick consistency that sticks to your spoon. Enjoy one spoon (or two) at a time. I like to pop the container, along with a spoon into my bag and pull it out when I need just little pick me up. So we’re not milk drinkers in this house hold. I ended up with a nearly-full half gallon carton of milk after making my hubby a birthday cake (first cake I ever made, but that’s a story for another time). 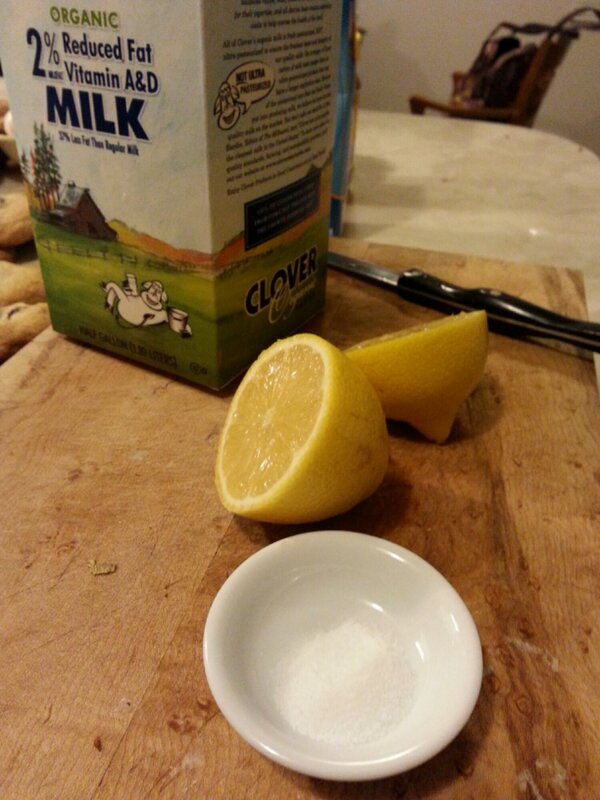 I looked at him and just threw it out there: “what can you make with milk? ” and his response was to Google that exact question. The two top options were dulce de leche and ricotta. Well that started my creative cooking juices flowing. 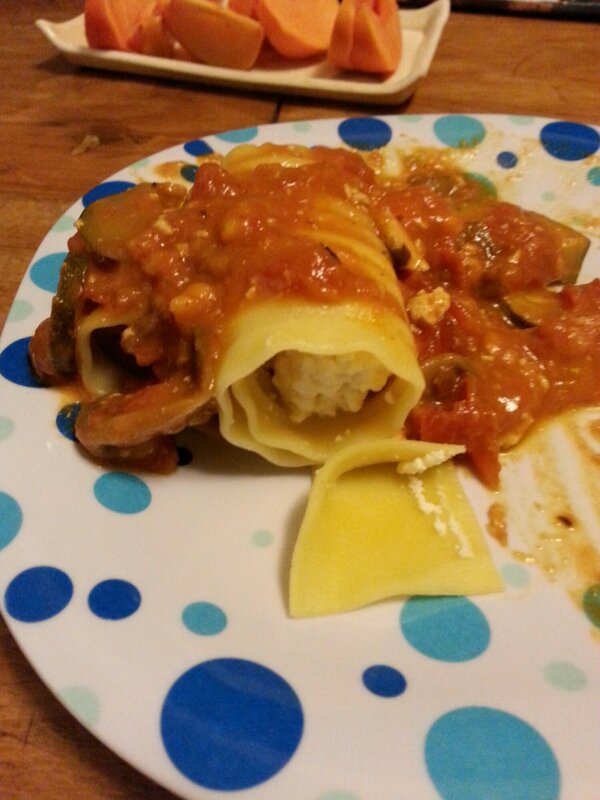 ..I had left-over pasta sauce and also a half box of lasagna noodles. 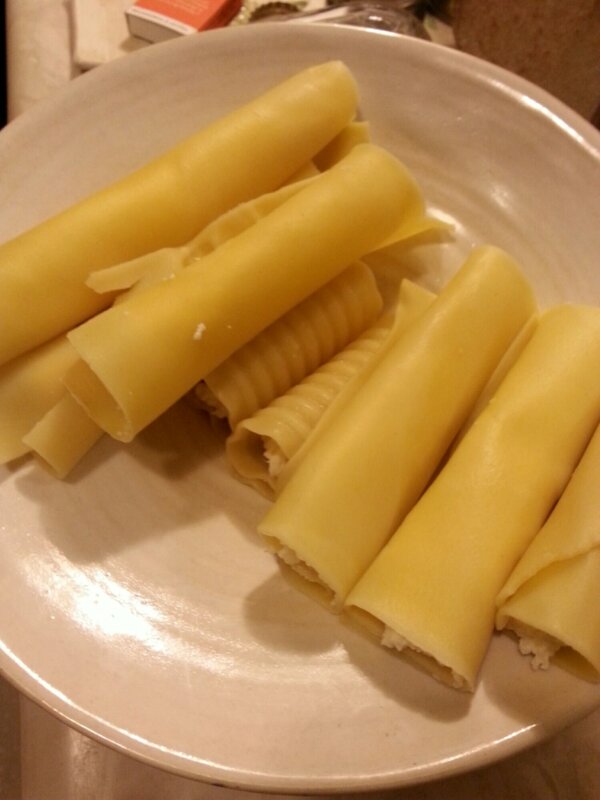 ..why not make ricotta stuffed pasta? But first, could we pull off homemade ricotta? Then I removed it from the heat, poured in the lemon juice and salt, stirred gently with a slotted spoon and waited 10 minutes. ..though you can start to see it curdle almost immediately. At this point my baby started to cry for the food only mommy can provide so hubby took over. 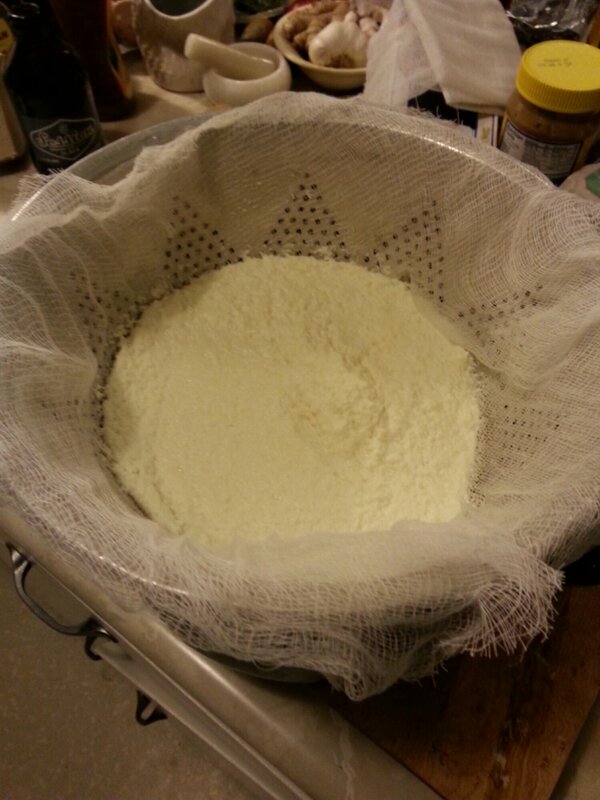 Using cheese cloth laid into a strainer set in an empty pot to catch the whey, he scooped the curds into it and let it sit another ten minutes. 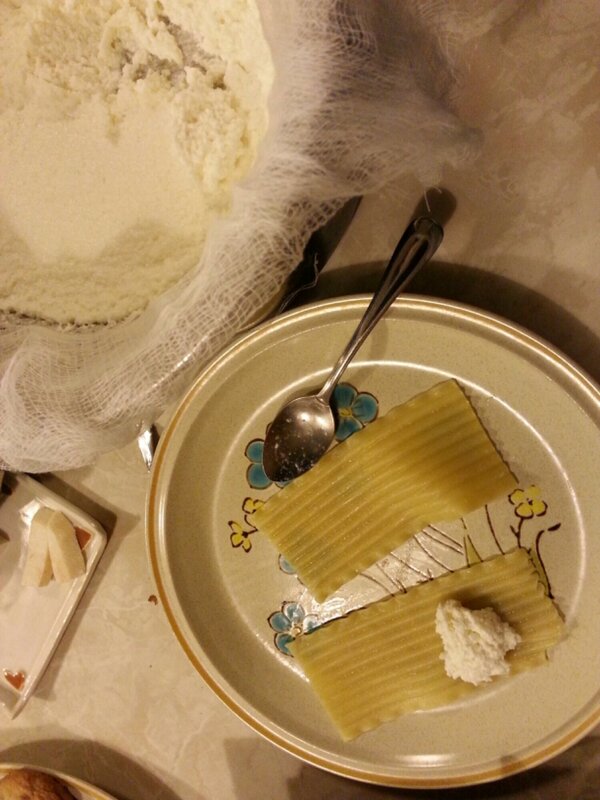 Then all that was left was to fill the pasta with the ricotta. We were so amazed by how easy it was to make. Literally anyone could do it. No doubt we’ll do it again. 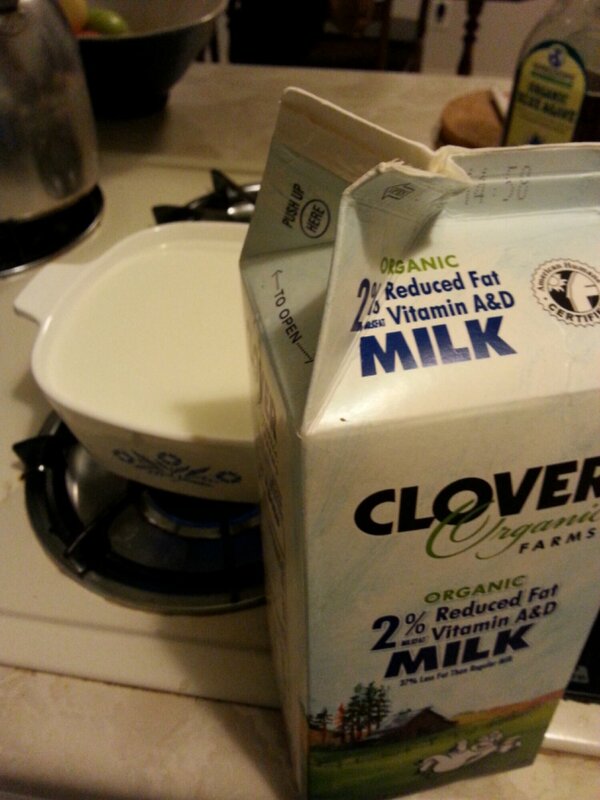 So glad we found this solution rather than letting the milk slowly go bad and eventually dumping it out.